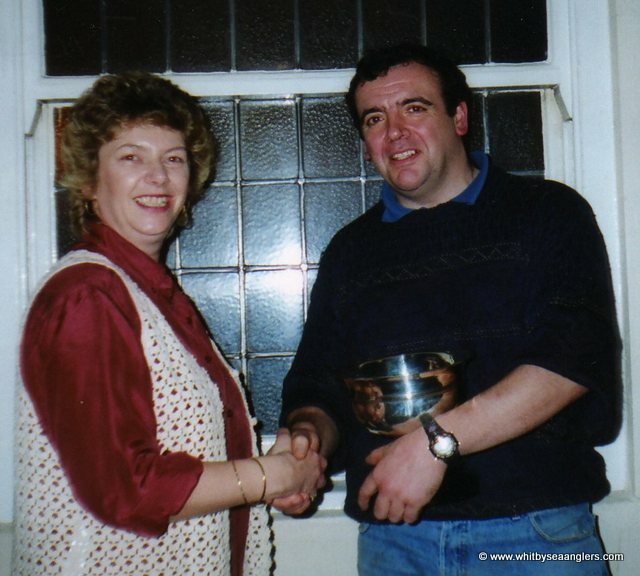 Adrian Nelson receives the Whitby Gazette Trophy from the Ship Inn landlady Barbara Tyler, 14th January 1996. Photograph by Bernard Vasey. 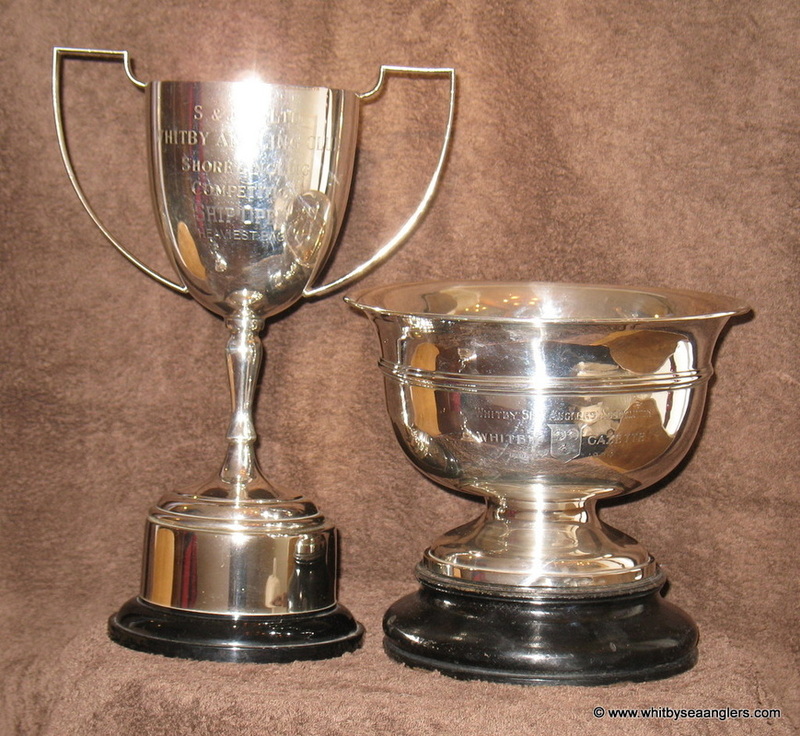 Nelson wins Gazette Trophy 14th January 1996. Sundays Ship Inn Open Competition sponsored by Vaux for the heaviest single codling only was fished under good conditions with a south easterly swell but with very poor results. Entries were a little lower than last years event, 75 anglers fished from 1pm to 6pm with only 11 weighing in a total of 16 fish for 31 lb. The first prize of £250 and the Gazette Trophy was awarded to Adrian Nelson of Whitby with a cod of 6 lb 09 oz, he also took the prize for the heaviest bag. Second place was shared by Ian Russell (Whitby) and Geof Dann (Teesside) with a fish of 2 lb 04 oz, each received £75. Fourth equal were William Atkinson and Andy Smith 2 lb 02 oz. 6th - Ian Russell - 2 lb 01 oz. 7th - Colin Sharp 1 lb 15 oz. 8th - Paul Short 1 lb 14 oz. 9th - Ian Russell 1 lb 10 oz. 10th - Kevin Thompson 1 lb 09 oz. 11th - Mark Robinson 1 lb 07 oz. 12th - Alan Jemmerson 1 lb 04 oz. 13th - Paul Kilpatrick 1 lb 01 oz and 0 lb 10 oz. As reported by Bernard Vasey January 1996.